"Michael Nesmith was thrown into the pop spotlight, the poplight if you will, as a member of The Monkees. But upon leaving the group in 1970, he started his own innovative musical project The First National Band (FNB). The FNB released three groundbreaking, genre defining albums (Magnetic South/Loose Salute/Nevada Fighter) that sold very little on their initial release, but have since been heralded as absolute classics that helped shape country rock. With the passing of original members John London and Red Rhodes, it was thought the FNB would never perform again. 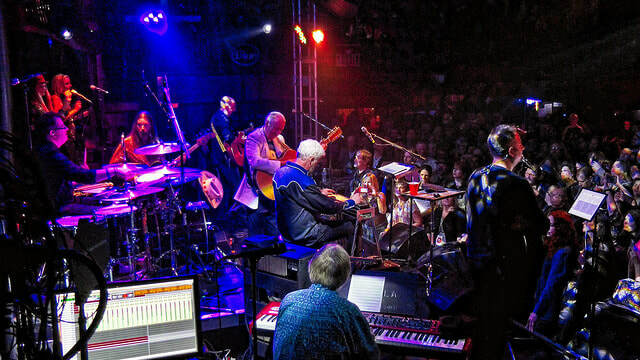 But the internet went into meltdown late last year when Nez announced he was assembling a new posse of musicians to honour this music and take it out on the road again. Dipping a toe in the water, a handful of select venues were booked, in case history repeated itself and no one came! But come they did, in droves. The shows sold out almost immediately and made for one of the most memorable and surprising comebacks in musical history -- The First National Band back on tour. The album 'Michael Nesmith And The First National Band Redux Live at the Troubadour' is probably the most historically important release from 7a Records, the British label that specializes in Monkees related releases. The concert presented on this double LP (with bonus track Rio) and single CD was 50 years in the making and is a must have for any music fan. The love and affection for songs like 'Different Drum', 'Joanne' and 'Grand Ennui' is infectious -- you can feel the good vibes and warmth emanating from the record! 7a Records have been working with Christian Nesmith who recorded, mixed and produced this album. He has managed to make one of the most exciting live albums of 2018. Michael, who is now 75 years old, still sounds like that 20 something kid who punched a hole in a hotel wall when Don Kirshner was bossing him around. Sure, hes aged a little in tone, but man, that voice is just incredible. You want to sink into it. Eat it like cake. The album is released with previously unseen photos and extensive liner notes by Michael Nesmith, written in his own unique style as a limited edition 2LP gatefold set on 180g opaque gold vinyl. The vinyl features a special bonus performance of the song 'Rio'." Videoranch is thrilled to offer this beautiful double LP set of an unforgettable, historic performance. Signed by Michael Nesmith in permanant gold ink, this release is an absolute must-have for Nezheads and vinyl collectors alike! Limited Availability, ships 1-2 weeks.